I was dropping off Caiden yesterday, rather in a hurry as I had a meeting scheduled with my Director and I was a bit late for it - it was a last minute meeting) when I noticed the latest and greatest artwork on the wall. Whenever Caiden does art work, or when I pick him up from school I always talk to him about what he learned that day, what he did and then we look at his artwork. Again, I was in a hurry and noticed the latest addition to the wall. 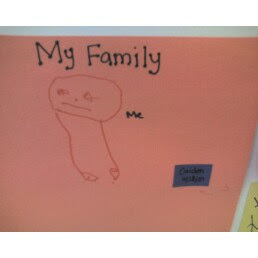 The kids were tasked to draw a portrait of their family. I searched for Caiden's portrait and the above is what I found. This stopped me DEAD in my tracks. He was the ONLY student to have a family of one. All the other students drew pictures of a parent and siblings, some even had grandparents. Caiden, however drew a picture with no mama, no daddy, no grandparents...just him. It broke my heart. I asked him why he was the only one in his portrait and he just said "I don't know". It ate at me all day. This affected me so much that I actually broke down and cried in front of my director, as I had JUST left the school and headed to my meeting with my director - it was still fresh in my mind. My point for saying that I cried was that I am NOT a crier, and I DEFINATLEY would not cry in front of another person! Thankfully, I happen to work for an amazing director who is a strong family man, and a very understanding person to boot. I had planned to work the full day, as my boss is in town just for this week, but this picture brought me back to reality. I left work early, took Caiden to the park where we played and talked and then we went out for some Sherbet. When I spoke with the teachers, they stated that they had JUST finished doing their self portraits, so he possibly felt that he was still doing his self portrait. When I arrived to pick him up at the school, I asked him who is family is and he said "Mama, Daddy and Caiden". I asked him again why he drew just him, and explained that I was not angry, but I was hurt as I love him very much. He said he was sorry and gave me a hug. I asked him if he felt that I didn't spend enough time with him and he said he didn't feel that way. The teachers also mentioned that out of all of the students, no one mentioned Daddys, except for Caiden. She said even when the dad drops them off, they always omitted that dads, even when questioned as to "who dropped you off this morning". Caiden was the only student that when asked said he had a dad. I thought that was a bit interesting. I may be overreacting, or reading too much into it, but it was a wake-up call to me. I try my best to balance work and my home life, but I do find myself working (on conference calls and such) all the way to and from work. I get sucked into the void that can become my job sometimes, but I always try to talk to Caiden on our commute and sing songs as well. When I am home, I have made it a point to NOT turn on my computer to work until Caiden is in bed and asleep, but maybe I need to work more at balancing my work life and home life. After spending time with Caiden and speaking to him about it, I don't think Caiden feels neglected, but it is always important to be reminded of your priorities. I happen to have a very empathetic, sensitive little boy, who works hard to be a good boy and make me happy. He told me the other day as we were driving home and I was stressed and emotional that he was going to take care of me and "scratch my back" (aka massage my back). He said, "when I scratch your back it makes you happy". He told me this morning that he was going to take care of me, and I need to let him. This from my 3-year-old. So sweet, but not his job. Awwwww...what a sweet story. Caiden is a good boy!! I hug my munchkins everyday...so what if mine have 4 legs and fur!! Caiden is always thinking about his mommy and daddy when he is with us. He talks about all his family, his aunts, uncles, grandmas and grandpas. He knows that he is loved. I'll bet the tears came so easy because you are expecting.........don't worry he loves us all! I have totally been there. I felt the same way again when I had Charlie. Its so hard being a Mom and being a working Mom is INSANE! I really believe its one of THE hardest things a woman can do. You are such a good Mom Melissa. Dont be too hard on yoursel. I bet anything that your doing an amazing job with Caiden and you will do an amazing job with the next one as well.